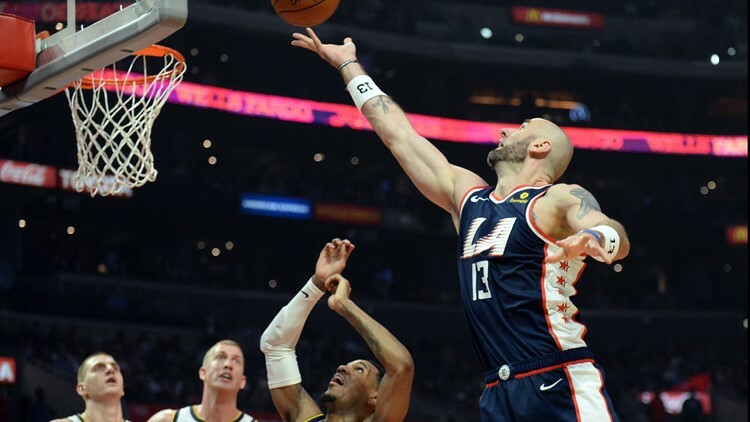 Los Angeles Clippers center Marcin Gortat (13) plays for the ball against Denver Nuggets guard Monte Morris (11) and forward Mason Plumlee (24) during the first half at Staples Center. Nuggets: Denver opened the season with a 107-98 victory over the Clippers. LA coach Doc Rivers on the difference between the Nuggets then and now. "They believe now," he said. "And they're at that point, where it really doesn't matter who they have on the floor. That's how confident they've become." Nuggets: Continue on the road to meet the Spurs on Wednesday.